Cold triple wood Smoked Salmon recipe. Triple wood cold smoked salmon. Cold smoked salmon. 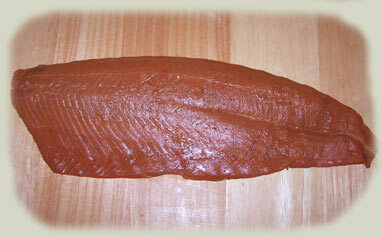 This Smoked Salmon recipe uses maple, cherry and apple wood for a great cold smoked salmon. Smoking time is 24 hours in a cooled container. Start the cherry cartridge and place into SmokePistol. Smoking will take about 24 hours without heat (cold smoke). Make sure the SmokePistol is set to low and slowly smoke. Replace spent cherry cartridge with maple cartridge and then use the two apple cartridges. When smoking is done wrap salmon in plastic wrap and refrigerate for 24 hours. Slice salmon on diagonal to make wide slices and enjoy. This is a favorite for people that don't even like salmon.